Forty years ago, Professor Lowell Matson began teaching the first courses for a theater arts major at Wagner College. Before that time, the College had only an extracurricular drama club. Today, the Department of Theater and Speech has 10 full-time professors and about 290 students who produce four Main Stage shows and four studio theater productions every year — and, year after year, the program is ranked among the top 10 college theaters in America. 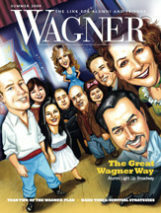 In this issue of Wagner Magazine, we examine Matson’s legacy with 10 quick sketches of Wagner theater grads who have built successful careers on and around Broadway. A master class in her senior year led Joslyn to her first professional gig that summer in Pittsburgh. She made her off-Broadway debut in 1976 in The Fantasticks. Three years later, she was in the original cast of Broadway’s Sweeney Todd. A 1982 leading role in A Doll’s Life, a notorious flop, could have proven disastrous — but Joslyn persevered, continuing to find steady work in major productions like Les Misérables and Into the Woods. After Joslyn left the musical theater in 2000 — a medical condition had damaged her vocal chords — she and her husband, Broadway composer and conductor Mark Mitchell, began pursuing adoption. They welcomed 18-month-old Molli, a Chinese orphan, into their family in 2004. “Going through menopause and the terrible twos at the same time was quite an experience,” the 55-year-old full-time mom said recently, laughing. Two years after leaving Grymes Hill, the career of Brooklyn-born Randy Graff ’76 H’01 took off. Within a few months of landing her first professional role off Broadway, she made her Broadway debut as an understudy in Grease. The following year, she was part of the original cast of Saravá, which earned mixed reviews. In 1986, Graff began rehearsals for her signature Broadway role: the tragic heroine Fantine in Les Misérables. The show was a huge success, but it also took its toll. “It’s not easy to die onstage every night,” she said. Graff’s next Broadway role, in City of Angels, won her a Tony Award. “Did I get a pile of scripts after winning the Tony? No-o-o-o,” she recalled, “but my price went up.” And she has worked steadily in shows including Moon Over Buffalo, High Society, and the 2004 revival of Fiddler on the Roof. Michael Portantiere’79’s penchant for the pen evidenced itself almost immediately after enrolling at Wagner. 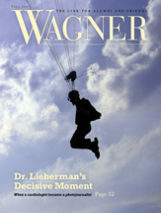 He wrote about theater for the Wagnerian as well as the Staten Island Register, an independent weekly newspaper. Portantiere is now in the third decade of his career as a theatrical journalist. His first book, The TheaterMania Guide to Musical Theater Recordings, with a foreword by Jerry Herman, was published in 2004. A new book, Forbidden Broadway: Behind the Mylar Curtain, was co-written with Gerard Alessandrini, creator of the long-running Broadway parody revue. D’Elia has worked steadily ever since, mostly in regional theater productions and national touring companies, but also in Broadway shows, most notably Kiss of the Spiderwoman, winner of the 1993 Tony Award for Best Musical. He spent some time in L.A., working in television, but never really took to the City of Angels. D’Elia returned to his rent-stabilized apartment in Hell’s Kitchen and has based himself out of New York ever since. A high school summer job at the Gateway Playhouse in eastern Long Island, where he worked with several Wagner students and alums, led Matt Lenz ’86 to Grymes Hill. After graduation, Lenz spent about four years working his way through a series of acting jobs, including a steady gig in the campy off-Broadway hit Vampire Lesbians of Sodom. “After about the fourth month, it stopped being fun,” Lenz recalled. That was when he decided to become a director, signing on with Disney Productions in 1993 as an assistant director for Beauty and the Beast, followed by three years on Aida. Lenz joined Hairspray as A.D. at the end of 2001. The show opened on Broadway the following August. The next spring, it nearly swept the Tony Awards for musicals. The next big project for Matt Lenz: assistant directing Catch Me If You Can, based on the 2002 movie, which premieres in Seattle this summer before opening on Broadway. Her signature role as Gertrude McFuzz in Broadway’s Seussical came in 2000, winning her a Drama Desk nomination for Best Featured Actress. LaManna married Army Capt. Mike McDermott while rehearsing for Sweet Charity in early 2005. By mid-July, LaManna was carrying their daughter. “I was five and a half months pregnant by the time I left the show,” she said. Mia McDermott was born the following April. LaManna’s latest role was in last year’s off-Broadway comedy hit, Enter Laughing. Buddy Thomas ’91’s focus at Wagner was playwriting, and his student work made quite an impression. In the meantime, Thomas began working at International Creative Management, where he represents playwrights like Nell Benjamin (lyricist for Legally Blonde: The Musical) and the estates of theater greats William Inge and Arthur Miller. Yet that is just what Buddy Thomas has done. His campy new play, Devil Boys from Beyond, will be performed in August in the New York International Fringe Festival. Devil Boys will bring Thomas back together with actor Paul Pecorino ’92 and, perhaps, Matt Lenz ’86 as director. Kathy Brier ’97’s first break after graduation came when she was tapped for the off-beat off-Broadway show, Bat Boy, the Musical, in 2001. A year later, she was hired to play young Marcie Walsh on the ABC daytime soap opera One Life to Live. In 2003, things got really crazy for a while when she was hired to play Tracy Turnblad in Hairspray on Broadway, and she decided to keep her day job, too. She played both Marcie Walsh and Tracy Turnblad for eight and a half months. Shortly after returning full-time to OLTL in May 2003, Brier was nominated for a daytime Emmy in the supporting actress category. Since late 2007, soap-opera fan mags have been reporting on Brier’s desire to get out of daytime TV and return to the stage. This March, the producers of One Life to Live announced that her contract, which expired at the end of May, would not be renewed. What’s next for Kathy Brier? Stay tuned for the next episode of As the Alumna Turns. Bret Shuford ’01 auditioned for his first professional role in a Paper Mill Playhouse production of Carousel during spring break of his senior year. Carousel got Shuford an Equity card, his ticket into the professional theater world, and he has used that ticket well. Shuford landed his first role in the ensemble of a Broadway show, Chitty Chitty Bang Bang, in January 2005. In June 2006, he signed on with Beauty and the Beast. Less than a year later, he began rehearsals as part of the original company of The Little Mermaid, which is where he is currently performing. Most nights, Shuford is part of the ensemble on stage — but, occasionally, he gets to play the male lead, Prince Eric, when actor Sean Palmer is away. West Side Story has played a recurring role in the stage career of Haley Carlucci ’08. During the summer of 2003, she played in a community college production of the show. She performed in West Side Story again in 2005 as a Wagner sophomore, playing Maria. Last spring, as graduation approached, Carlucci appeared in the theater department’s annual senior showcase performance, where she got signed by an agency. “They sent me in for the new revival of West Side Story,” Carlucci said. “I did three auditions — and then I waited. Carlucci was cast as the understudy for Maria.